TB is the ninth leading cause of death worldwide and the leading cause from a single infectious agent, ranking above HIV/AIDS. 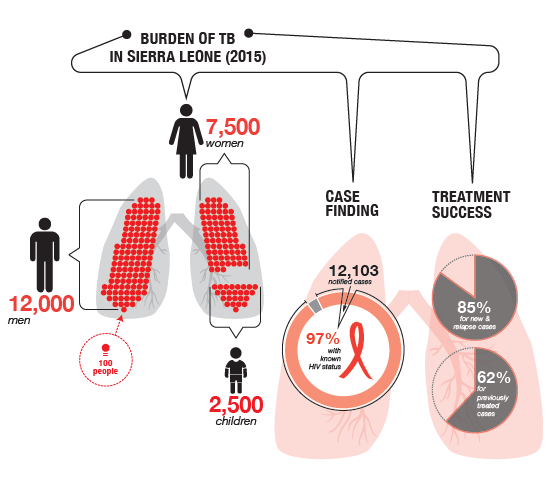 Over 25% of TB deaths occur in the African Region. The emergence of multidrug-resistant TB (MDR-TB) poses a major health security threat and could risk gains made in the fight against TB. World TB Day provides the platform for affected persons and communities, civil society organizations, health-care providers, policy makers, development partners and others to advocate, discuss and plan further collaboration to fulfil the promise of reaching all people with quality TB prevention and care services, as well as enabling TB prevention through multisectoral development efforts. Tuberculosis (TB) is the ninth leading cause of death worldwide and the leading cause from a single infectious agent, ranking above HIV/AIDS. In 2016, 2.5 million people fell ill with TB in the African region, accounting for a quarter of new TB cases worldwide. An estimated 417,000 people died from the disease in the African region (1.7 million globally) in 2016. Over 25% of TB deaths occur in the African Region. Seven countries account for 64% of the new TB cases in 2016, with India leading the count, followed by Indonesia, China, Philippines, Pakistan, Nigeria, and South Africa. TB is a leading killer of HIV-positive people: in 2016, 40% of HIV deaths were due to TB. Multidrug-resistant TB (MDR-TB) remains a public health crisis and a health security threat. WHO estimates that there were 451,551 new cases with resistance to rifampicin in the African region – the most effective first-line drug. Globally, TB incidence is falling at about 2% per year. This needs to accelerate to a 4–5% annual decline to reach the 2020 milestones of the End TB Strategy. Globally an estimated 53 million lives were saved between 2000 and 2015 and 10 million lives were saved in the African Region between 2000 and 2014 through TB diagnosis and treatment. Tuberculosis mostly affects adults in their most productive years. However, all age groups are at risk. Over 25% of cases and deaths are in the African region. People who are infected with HIV are 20 to 30 times more likely to develop active TB (see TB and HIV section below). The risk of active TB is also greater in persons suffering from other conditions that impair the immune system. One million children (0–14 years of age) fell ill with TB, and 170 000 children (excluding children with HIV) died from the disease in 2015. Tobacco use greatly increases the risk of TB disease and death. More than 20% of TB cases worldwide are attributable to smoking. TB occurs in every part of the world. In 2015, the largest number of new TB cases occurred in Asia, with 61% of new cases, followed by Africa, with 26% of new cases. In 2015, 87% of new TB cases occurred in the 30 high TB burden countries. Six countries accounted for 60% of the new TB cases: India, Indonesia, China, Nigeria, Pakistan, and South Africa. Global progress depends on advances in TB prevention and care in these countries. Common symptoms of active lung TB are cough with sputum and blood at times, chest pains, weakness, weight loss, fever and night sweats. Many countries still rely on a long-used method called sputum smear microscopy to diagnose TB. Trained laboratory technicians look at sputum samples under a microscope to see if TB bacteria are present. Microscopy detects only half the number of TB cases and cannot detect drug-resistance. The use of the rapid test Xpert MTB/RIF® has expanded substantially since 2010, when WHO first recommended its use. The test simultaneously detects TB and resistance to rifampicin, the most important TB medicine. Diagnosis can be made within 2 hours and the test is now recommended by WHO as the initial diagnostic test in all persons with signs and symptoms of TB. More than 100 countries are already using the test and 6.2 million cartridges were procured globally in 2015. Diagnosing multi-drug resistant and extensively drug-resistant TB (see Multidrug-resistant TB section below) as well as HIV-associated TB can be complex and expensive. In 2016, 4 new diagnostic tests were recommended by WHO – a rapid molecular test to detect TB at peripheral health centres where Xpert MTB/RIF cannot be used, and 3 tests to detect resistance to first- and second-line TB medicines. Tuberculosis is particularly difficult to diagnose in children and as yet only the Xpert MTB/RIF assay is generally available to assist with the diagnosis of paediatric TB. TB is a treatable and curable disease. Active, drug-susceptible TB disease is treated with a standard 6 month course of 4 antimicrobial drugs that are provided with information, supervision and support to the patient by a health worker or trained volunteer. Without such support, treatment adherence can be difficult and the disease can spread. The vast majority of TB cases can be cured when medicines are provided and taken properly. Between 2000 and 2015, an estimated 49 million lives were saved through TB diagnosis and treatment. 34% of people living with HIV in the African Region in 2016 were infected with TB bacteria. People living with HIV are 20 to 30 times more likely to develop active TB disease than people without HIV. 42% of HIV positive people (newly enrolled in care) are on preventive treatment against TB in he region. African region. About 35% of deaths among HIV-positive people were due to TB in 2015. In 2015 there were an estimated 1.2 million new cases of TB amongst people who were HIV-positive, 71% of whom were living in Africa. WHO recommends a 12-component approach of collaborative TB-HIV activities, including actions for prevention and treatment of infection and disease, to reduce deaths. Anti-TB medicines have been used for decades and strains that are resistant to 1 or more of the medicines have been documented in every country surveyed. Drug resistance emerges when anti-TB medicines are used inappropriately, through incorrect prescription by health care providers, poor quality drugs, and patients stopping treatment prematurely. Multidrug-resistant tuberculosis (MDR-TB) is a form of TB caused by bacteria that do not respond to isoniazid and rifampicin, the 2 most powerful, first-line anti-TB drugs. MDR-TB is treatable and curable by using second-line drugs. However, second-line treatment options are limited and require extensive chemotherapy (up to 2 years of treatment) with medicines that are expensive and toxic. In some cases, more severe drug resistance can develop. Extensively drug-resistant TB (XDR-TB) is a more serious form of MDR-TB caused by bacteria that do not respond to the most effective second-line anti-TB drugs, often leaving patients without any further treatment options. WHO estimates that between 36 000 and 44 000 multi-drug resistant (MDR-TB) cases occurred in the AFRO Region in 2016. Among new MDR-TB cases, 15% developed resistance to rifampicin (the most effective first-line medicine) and needed MDR-TB treatment. Globally, the MDR-TB burden largely falls on 3 countries – China, India, and the Russian Federation – which together account for nearly half of the global cases. About 9.5% of MDR-TB cases had XDR-TB in 2015. To date, all countries of the African region except Seychelles have notified cases of multi-drug resistant TB (MDR-TB) and 13 countries have ever reported case of extensively-drug resistant tuberculosis (XDR-TB). Further, there continues to be a diagnosis / treatment gap with only approximately 68% of diagnosed. In 2016, WHO approved the use of a short, standardised regimen for MDR-TB patients who do not have strains that are resistant to second-line TB medicines. This regimen takes 9–12 months and is much less expensive than the conventional treatment for MDR-TB, which can take up to 2 years. Patients with XDR-TB or resistance to second-line anti-TB drugs cannot use this regimen, however, and need to be put on longer MDR-TB regimens to which 1 of the new drugs (bedquiline and delamanid) may be added. WHO also approved in 2016 a rapid diagnostic test to quickly identify these patients. More than 20 countries in Africa and Asia have started using shorter MDR-TB regimens. By the end of 2015, 70 countries had introduced bedaquiline and 39 countries had introduced delamanid, in an effort to improve the effectiveness of MDR-TB treatment regimens. Providing global leadership on matters critical to TB. Developing evidence-based policies, strategies and standards for TB prevention, care and control, and monitoring their implementation. Providing technical support to Member States, catalyzing change, and building sustainable capacity. Monitoring the global TB situation, and measuring progress in TB care, control, and financing. Shaping the TB research agenda and stimulating the production, translation and dissemination of valuable knowledge. Facilitating and engaging in partnerships for TB action. The WHO "End TB Strategy", adopted by the World Health Assembly in May 2014, is a blueprint for countries to end the TB epidemic by driving down TB deaths, incidence and eliminating catastrophic costs. It outlines global impact targets to reduce TB deaths by 90%, to cut new cases by 80% between 2015 and 2030, and to ensure that no family is burdened with catastrophic costs due to TB. adaptation of the strategy and targets at country level, with global collaboration. The WHO Regional Office for Africa has also developed a framework for implementing the End TB Strategy in the African Region (2016 – 2020). This framework supports the adaptation and implementation of the Global Strategy in countries based on their contextual circumstances. Overall, the Region wants to reduce the number of TB deaths by 35%, the number of TB patients by 20% and attain 0% TB-affected families facing catastrophic costs due to TB.